Model IP3000 is an adjustable, 3/4" NPT pipe plug injection & sampling system commonly used in field and plant applications. The adjustable pipe plug allows the injection/sampling system to be inserted into the process to the required length. Process shutdown or process isolation is required for installation and inspection. The unit assembly consists of an insertion rod, a welded pipe plug, and an injection/sampling tip. The injection tip, which is threaded, welded, or machined to the end of the rod, can be either a quill, open, cap & core, or nozzle assembly type. Insertion length (I.L.) is calculated to the end of the rod and is based on a customer specified length. 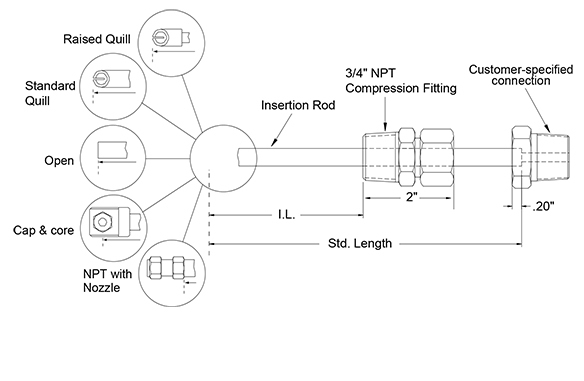 For standard injection systems, the maximum insertion length is given in the chart below. The standard pipe plug for the IP3000 is the 3/4" NPT pipe plug, although other options are available.